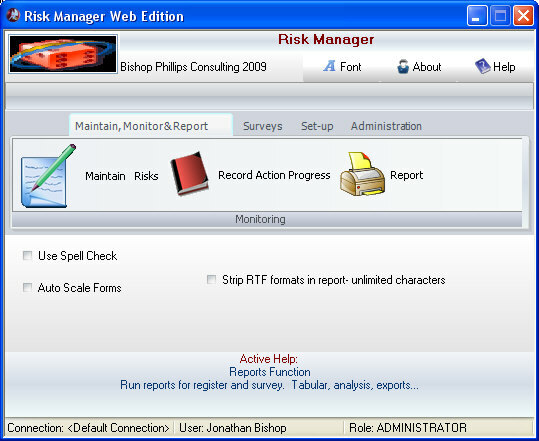 The BPC RiskManager Software suite is an Enterprise Grade risk management & governance software suite supplied worldwide, and developed and supported by Bishop Phillips Consulting. Originally developed between 1995 and 1997, the system is now in its 6th major version release with updates released roughly every 3 months. Version 6 was originally released in 2006, and the Enrima Edition (the current release) was first released in 2008. The latest version was released in 2011. It is updated continuously throughout the year and, as a client, we encourage you to actively participate in the development direction. 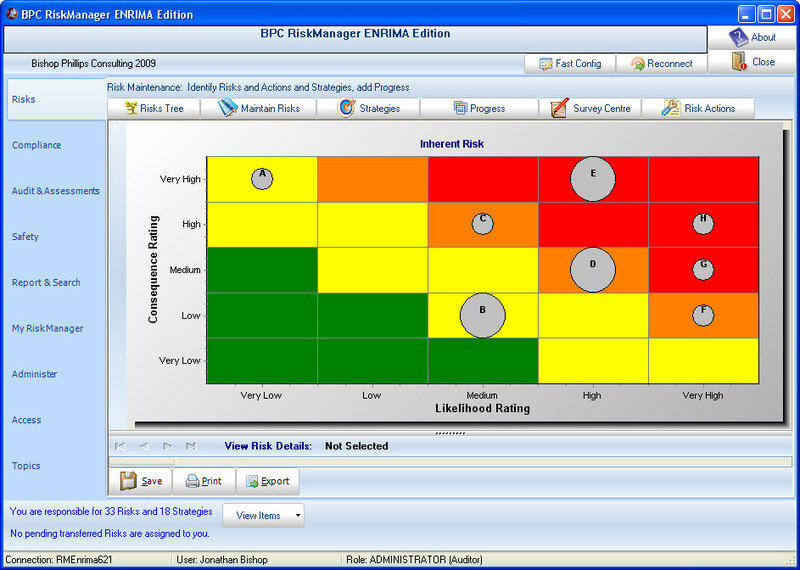 The Enrima edition of BPC RiskManager is a single-user and multi-user risk management, compliance management, financial statements certification, insurance, survey, incidents & hazards system all in one application. You can manage multiple organisations and simultaneously view governance issues as risks, compliance obligations (legislation, processes and procedures) and compliance topics simultaneously. It manages email based reminders for a large variety of user expectations internally. BPC RiskManager clients are head quartered in Australia, Canada, the United Kingdom and the United States of America. Global clients, of course have offices in many other countries. Bishop Phillips Consulting has local offices in both Australia and North America. The system is used extensively in the education sector with a very substantial presence in Universities in both Australia and Canada and commercial education providers and colleges in the USA. Other significant client groups include insurance providers (both primary insurers and reinsurers), central government agencies (such as federal & state/province departments and local government), utilities such as postal, electrical and water utilities. BPC RiskManager implements and substantially extends the Risk Management Standards "AS/NZS 4360:2004 :Risk Management", and "ISO 31000" and complies with the "ISO/IEC Guide 73- Risk Management – Vocabulary". The Risk Manager is not restricted to merely following the one interpretation of the risk standards. As a consequence of its long market history, BPC RiskManager implements a large number of divergent risk management methodologies or methods. Any combination of one to three assessment groups each containing ratings for likelihood, consequnce and control are possible. For example some clients use a risk management methodology that utilises risk budgets with three rating groups "Inherent, Residual and Target" where inherent ratings shift with external factors and target shifts with the corporate risk appetite (ie a risk budget) while the residual floats according to assessment ratings. Any number of self assessments in each group can be maintained together with a separate family of assessments and remediations created by audit/expert that coexist with management's risk assessments. Whether your preferred risk methodology uses quantification (quantitative risk analysis), or qualification (qualitative risk analysis), BPC Risk Manager directly supports the approach on a per assessment basis. Terminology (including fields names and purpose and screen captions) is fully customisable so the system can directly implement the corporate risk methodology / risk method. I want to evaluate BPC RiskManager without obligation for free, please. It will work for 60 days, and if you need more time you can contact us and request a longer evaluation. There are no limitations in the evaluation version and we will even give you support for free while you get it running. It is fully self installing and will open up accessing your first risk database when the installer finishes. If it isn't right for you, you can just uninstall after the 60 days with no further obligation to us.